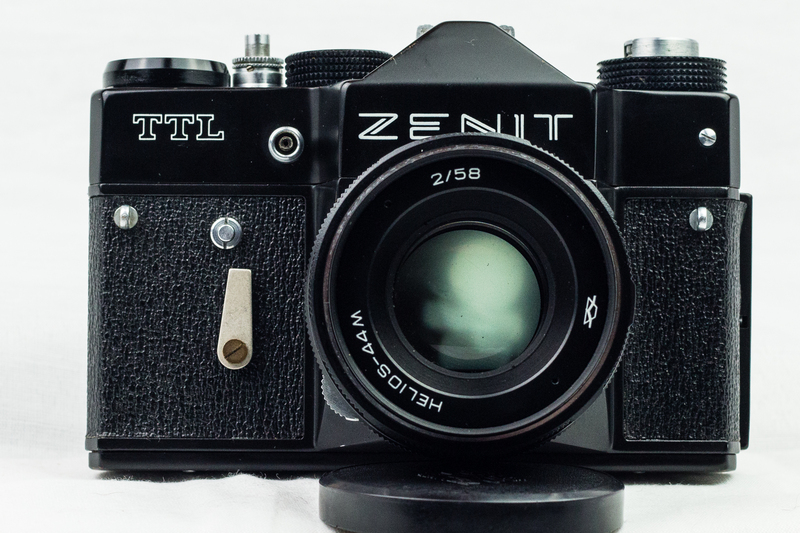 I bought my Zenit TTL in a small camera shop in Slovakia. Amidst the inevitable crowd of Zenit Es, FED rangefinders and random Japanese compacts in their second-hand section, it stood out thanks to its all-black paint scheme. I had a couple of Zenits already so I knew that if it was a good one, it would be a basic but solid bit of gear. Apart from a few minor cosmetic issues, the camera was perfect, the metering circuit worked once a battery was found and the curtain was like new. Most Soviet cameras except Kiev SLRs used cloth shutters which tend to degrade over time. I’ve seen cameras that were newer than this that had pinhole burns in the shutter curtain or ones where it had simply rotted due to poor storage. Mine is from 1981 (KMZ helpfully put the year of manufacture as the first two digits of their serial numbers) and it’s interesting to put it side-by side with my 1978 Zenit E for a direct comparison. Firstly, the body is almost unchanged. The door catch is exactly the same, the footprint is the same, in fact everything below the diopter is identical. The only external difference is the addition of two strap lugs on the front plate. Above the lens mount and internally however things are quite different. 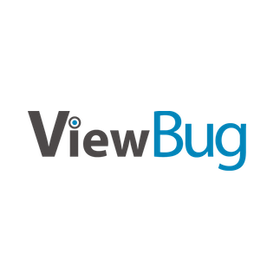 Most obviously the window for the selenium lightmeter cell is gone to be replaced by a very 80s rendering of the Zenit name. The TTL has a battery powered lightmeter that provides (as the name suggests) TTL metering. The small, mushroom-shaped shutterspeed dial has become a much chunkier item although the actual shutter mechanism is the same so there are no extensions to the fairly limited range (1/500th to 1/30th plus B). The popup rewind knob of the E is now a fold-out crank and there’s a battery cover on the back next to the viewfinder for the 1.5v cell needed if you want the lightmeter to work. Nothing else uses the battery, the rest of the camera is all mechanical. 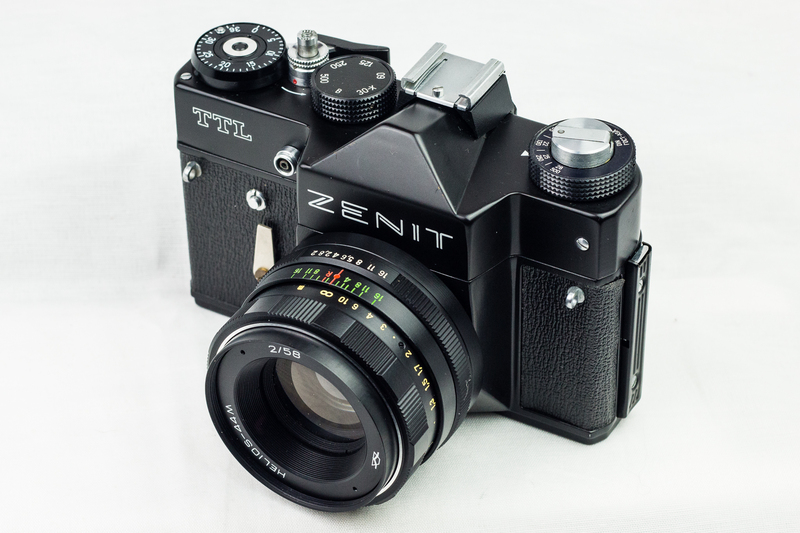 The TTL is also the first Zenit to incorporate an automatic stop-down link for the lens. I have several copies of the ubiquitous Helios-44 that was supplied with most M42 Soviet cameras, and this one is the only one that doesn’t have the preselector ring. Instead there’s a chunky thumbswitch where you might expect a DoF preview lever to go, that switches between automatic stop down and manual mode. When it’s set to auto, pushing the shutter button halfway stops down the lens and activates the lightmeter – which is shown in the viewfinder as a needle. The manual setting simply means that the selected aperture is set immediately, the diaphragm isn’t held open for focusing. 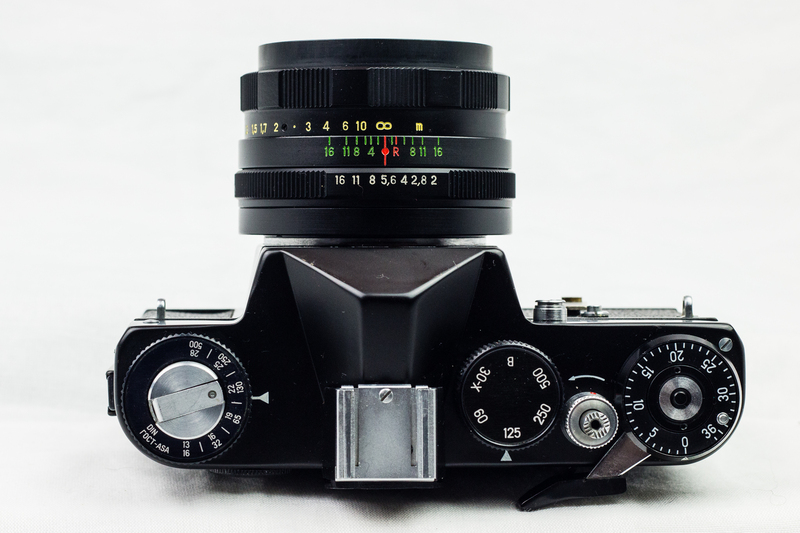 This lets you use the lens on other Soviet M42 cameras that generally didn’t have the automatic stop down feature. It’s not easy to focus unless the lens is open though as the viewfinder is not as bright as the one on my E.
Physically, it’s a bit heavier than the E, but shooting it feels almost identical – which isn’t surprising as the bulk of the mechanicals are completely unchanged. The same long-throw advance lever and the same daylight-only range of shutter speeds. The shutter button has migrated to the left into its own space instead of being co-axial with the advance lever and the frame counter. This makes it a bit fiddlier to disengage the drive sprocket for rewinding and means your finger has to stretch a little to take the shot. The lightmeter is reasonably accurate so far as I’ve tested it but this is not a camera for wildly variable lighting conditions. Perhaps due to its increased weight, it feels nicely put together and solid in the hand. There’s no play in any of the controls, nothing rattles or shifts when it shouldn’t. The mirror is completely undamped and the shutter closes like a train so there’s a noticeable amount of shutterslap if you are on slower speeds and there’s no mirror lockup system to compensate. Overall, and unlike most of the KMZ products, this feels like a quality camera to use despite its lack of advanced features.